Last year, JOHN McLAURIN put together this story about the Big Things of the Archdiocese. As we approach Christmas Holidays, and as the story hasn’t been on the new website before, we thought it worthwhile to reprint it here. If you DO happen to visit any of these big things, why not send us your photo/selfie and any comments you have? 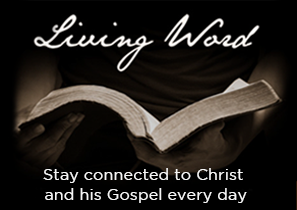 One of the most notable things about the Archdiocese is the rich diversity which binds us together from Eden in the southeast to Lake Cargelligo in the west. From the historic region of Goulburn to the oceanic views of the coast to the high country surrounding Mount Kosciuszko, there is much to see and do. Combine this with some of Australia’s finest farming regions “out west” and it is clear that our Archdiocese is blessed. It’s about the same size as Jordan or Portugal. More than twice the size of Estonia or the Netherlands. 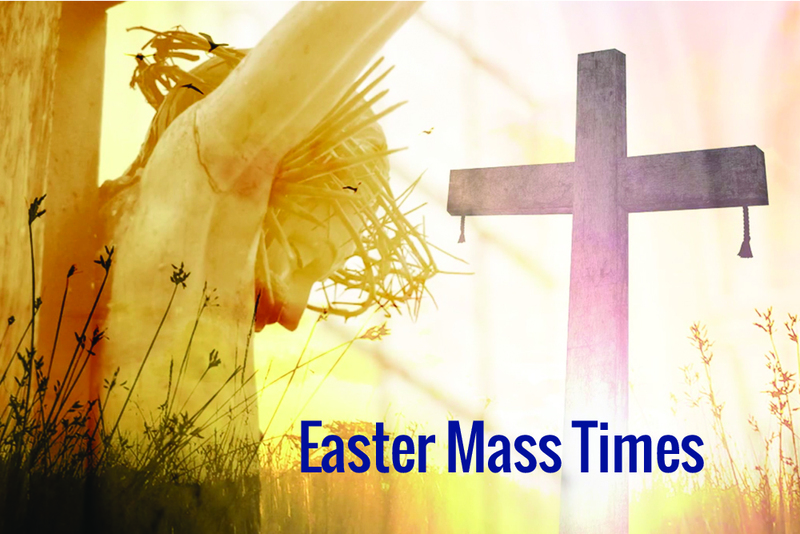 And in a BIG Archdiocese, it’s hardly surprising that we celebrate BIG things. One way to gain a greater appreciation for the diverse regions in which we live is to visit the BIG THINGS which exist within the Archdiocesan boundaries and as we head into the holidays, now’s as good a time as any to have a look. None of the BIG THINGS compare in size with the Christ the Redeemer statue in Brazil, but they are still worth a look. 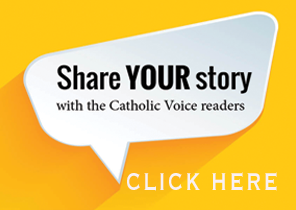 Some are more official than others, but Catholic Voice counted 11 BIG THINGS in the Archdiocese (more, we suspect, than any other Diocese or Archdiocese in the country?). 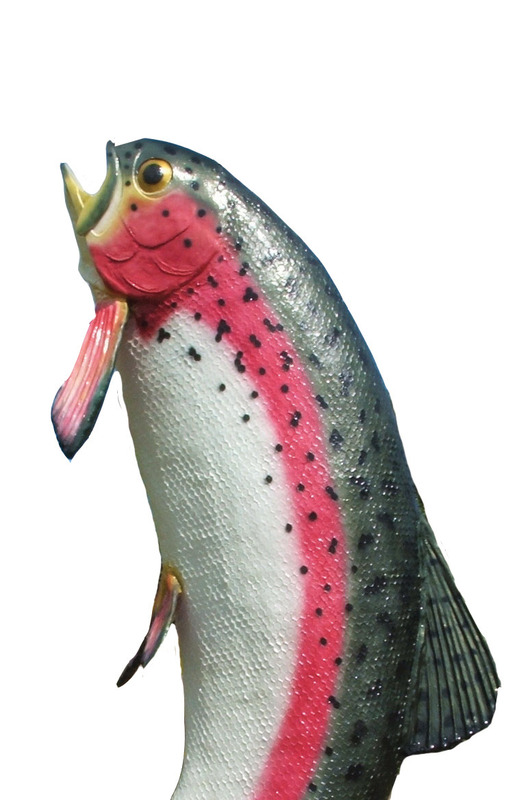 The Big Trout is impressive to say the least. Completed in 1973, the 10m high structure was built by Adaminaby artist Andy Lomnici and continues to be just as photogenic as ever. 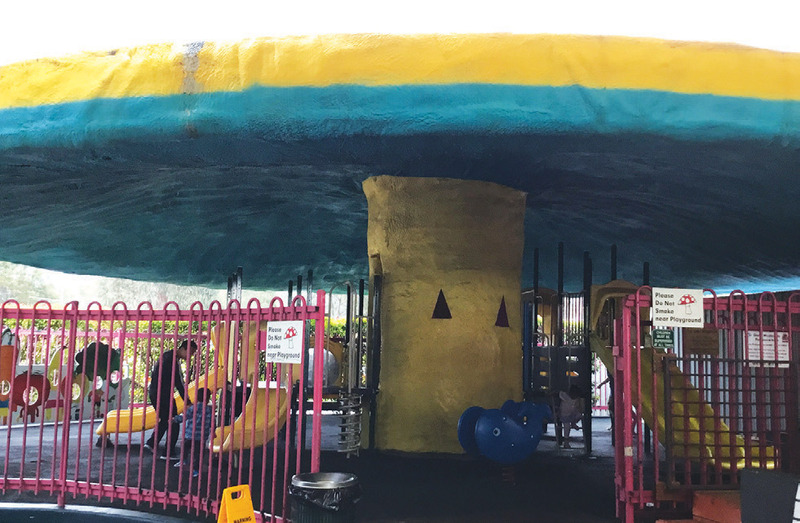 The locals continue to do a good job with its restoration. 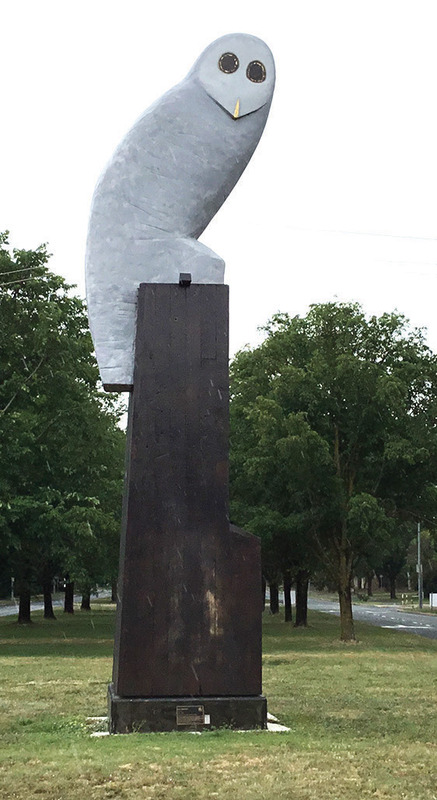 Drive to the corner of Belconnen and Benjamin Way and you will be greeted by an 8m high owl designed by Bruce Armstrong. The landmark sculpture which has been there since 2011 is made of cast composite, steel, hardwood, and paint. It honours the Powerful Owl (Ninox strenua), which is the largest owl in Australasia and an occasional resident of the ACT. 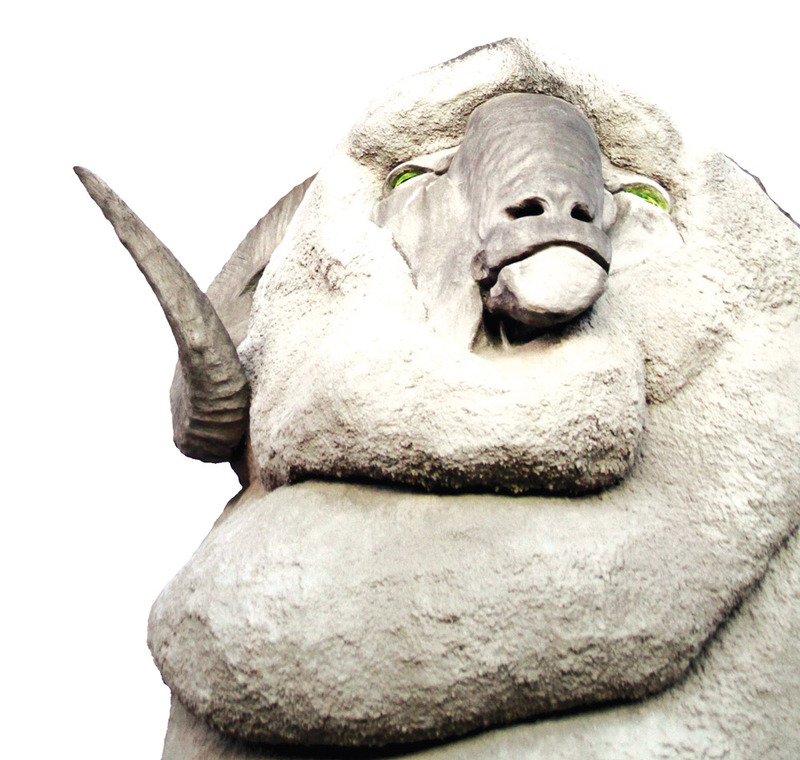 An old favourite the Big Merino is a celebration of Australia’s wool industry. Nicknamed Rambo by locals, the concrete structure stands 15.2m tall, was officially opened in 1985 and features more than just its looks. Visitors can buy wool products from the shop or they can climb to the top and look out through the Merino’s eyes. 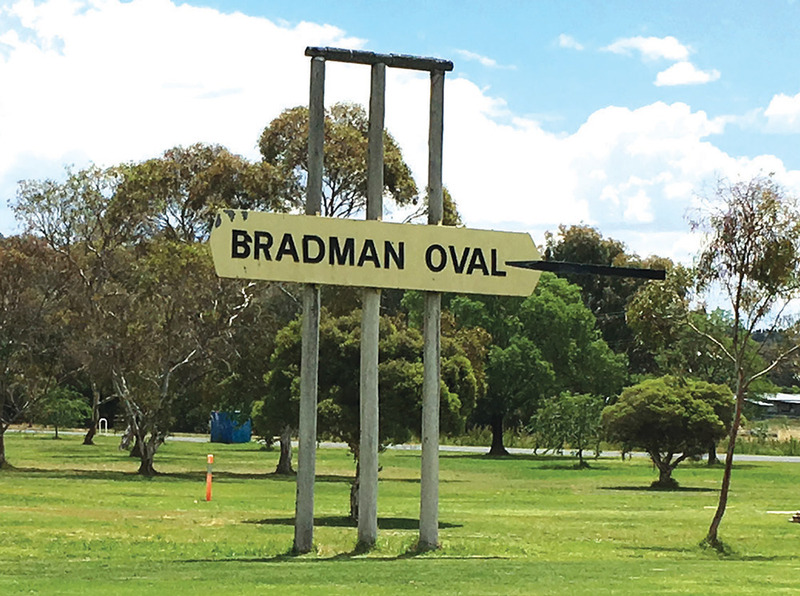 Being the birthplace of Sir Donald Bradman, Cootamundra will always be synonymous with cricket. In the middle of town is a captain’s walk featuring bronze sculptures of every Australian cricket Test captain. On the western side of town is the lesser known Big Cricket Stumps at the appropriately named Bradman oval. 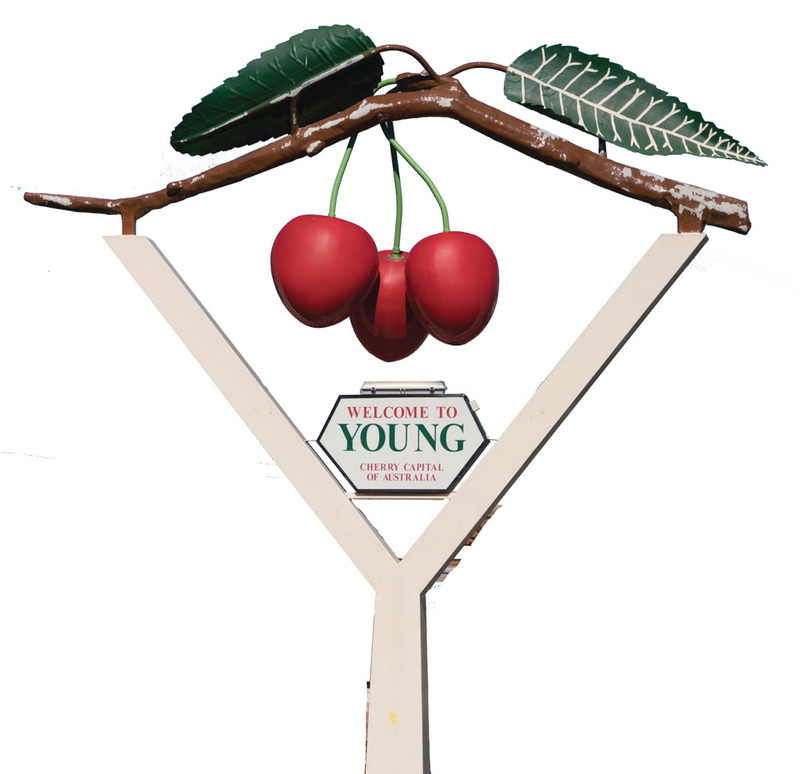 Incidentally on the same weekend in December that this newspaper is published, Young will hold its annual Cherry Festival. The Big Cherry greets you at Lovell Street near the old railway station. 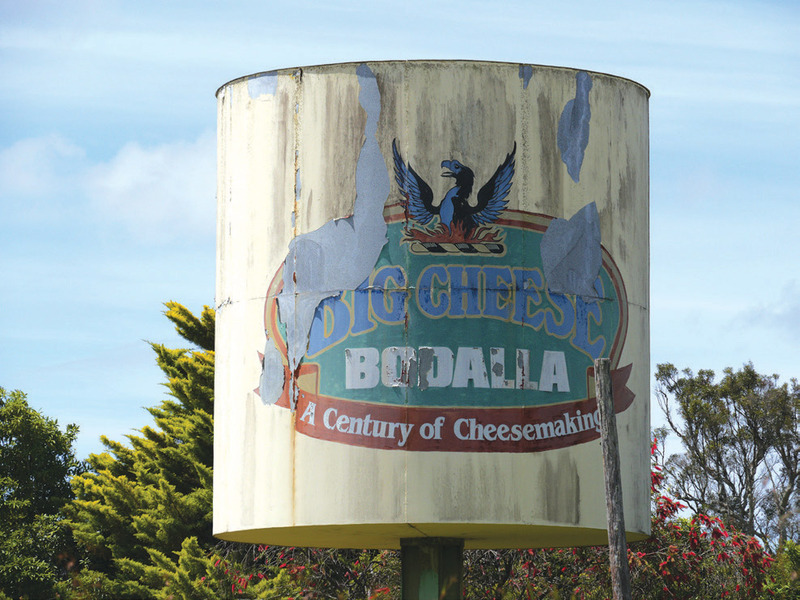 A contentious selection, the Big Cheese at Bodalla is fading away these days, but it has been included to show the region’s strong links with the dairy industry. Rightfully so, many associate the town of Temora with its aviation museum and renowned air show. But the town’s tourism is not a one trick pony (or horse for that matter). 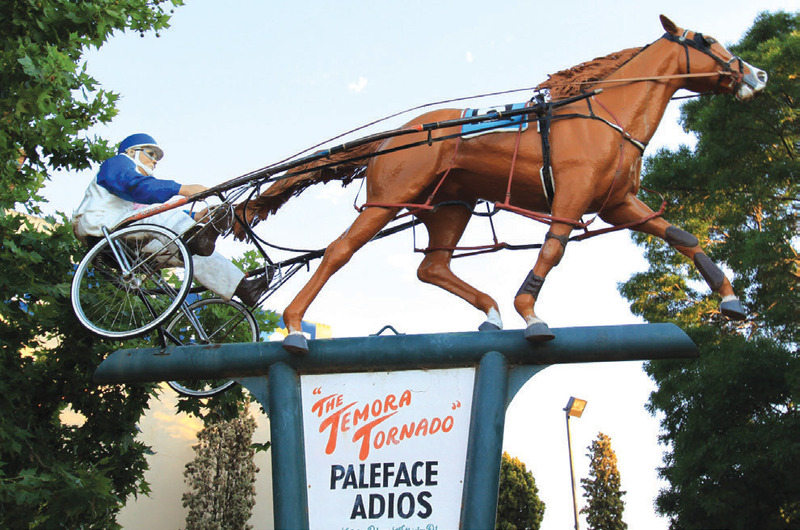 Temora was the home of Paleface Adios, considered to be the Phar Lap of harness racing in Australia during the 1970s. The life-size monument is located in the main street. 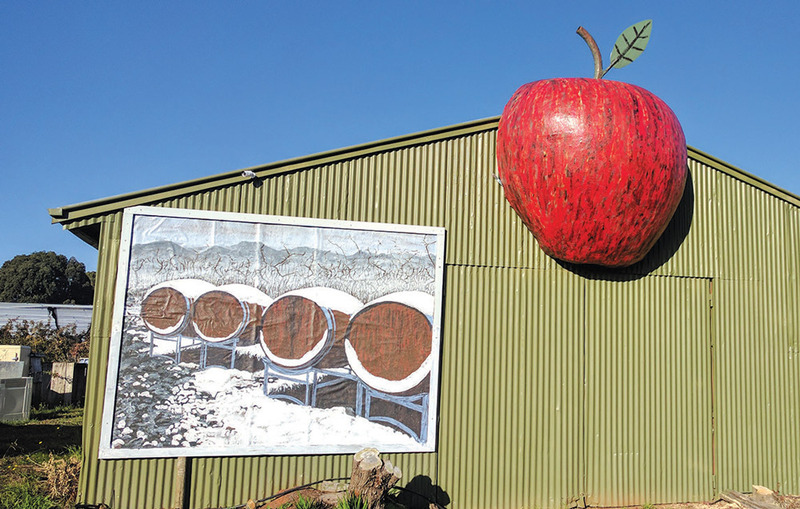 Batlow could easily lay claim to having the best apples in the country and so it is little wonder that they have the Big Apple structure. Unlike New York, Batlow is a small town of approximately 1000 people, but the Big Apple has put it on the map. 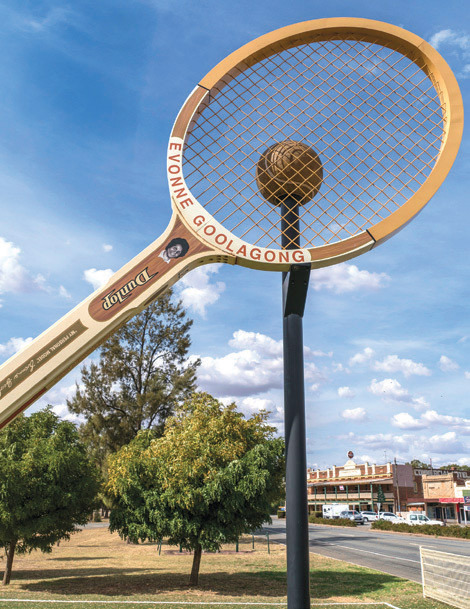 Erected in Evonne Goolagong Park in the main street, the Big Tennis Racquet was unveiled in October 2009 during the Barellan Centenary celebrations. The completed racquet is an exact 20:1 scale model of Evonne’s battered wooden signature Dunlop racquet. 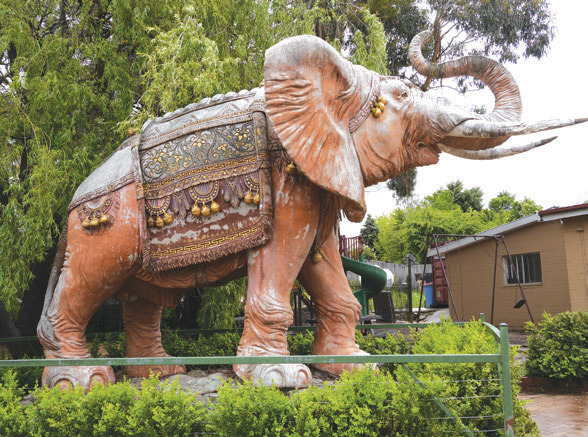 Of all things you think you might expect to see at Nimmitabel, a big elephant in the courtyard next to the town’s bakery is not one of them. Still hugely popular with tourists.